Our New Years lunch was held on Tuesday January 15th 2019 at Cube, a contemporary Japanese restaurant off Bond Street. 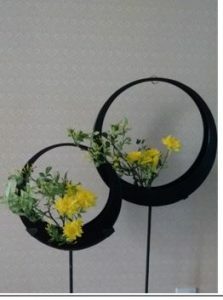 Welcome to the London Chapter of Ikebana International, a non profit organisation to promote Ikebana, the Japanese Art of Flower Arranging, and related arts and cultural activities. Each year we run a programme of demonstrations, an annual exhibition and workshop by different Ikebana schools so you can appreciate and learn more about the beauty and practice of Ikebana. We are not a teaching organisation though our teachers page gives you contact details of teachers and their schools if you wish to take lessons, or to find out more about events run by individual ikebana schools.